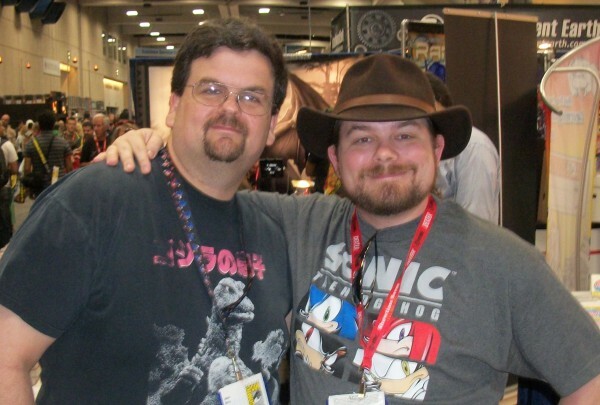 Last week Jason and I had the pleasure to sit down with Ian Flynn, writer of Sonic the Hedgehog, Sonic Universe, Megaman, New Crusaders and Dawn Best’s upcoming web comic Sylvanna. Join us we have not one, but two interviews with the architect of the Sonic and Megaman crossover Worlds Collide: a text interview written up by Jason Berry and a two and a half hour long interview hosted by me on Sonic Talk featuring dozens of questions from fans like you. Also, special thanks to Ian Flynn, who not only devoted a considerable amount of time to this, but also answered far more questions for the text interview than he had initially promised, due to me sending him the wrong text file that included a dozen questions that I had intended to omit. Enjoy! You can also find the Sonic Talk interview here. Jason Berry: You’re a very busy man, you are working on four books right now. Actually, five counting your kickstarter project with Dawn Best “Sylvanna”. How do you find the time to write all those? Ian Flynn: In fits and starts. Some days I can knock out a lot in a day, other days I’m caught up in other business. TSS: What’s a typical work day like for you? IF: I wish there was something “typical.” I’ve had days of almost non-stop email correspondence with creative jam sessions, days where I’ve had multiple scripts come in for revision, and days where I’m twiddling my thumbs. TSS: Do you direct exactly what you want your artists to draw panel by panel or is there a bit more freedom there? IF: I try to be directive while leaving room for artistic interpretation. Giving clear panel-by-panel descriptions, page layouts and the like, I take as much guess work out of the composition as possible. That really helps the artist move through the page quickly. At the same time, if they’ve got a better idea, I’m perfectly happy to let them work their magic. TSS: Speaking of Sylvanna, can you go into more detail on that book and your collaboration with Dawn Best? IF: It’s a project Dawn’s been tinkering with for… cripes, fifteen years now or so? I was a big fan of it when she first tried to launch the project and we’ve kept in touch about it ever since. It’s a fantasy epic about a group of heroic bats, set on a quest to find five crystal shards. Standing in their way are their ancestral enemies, the hawks, and their recently awakened and very anti-bat god, Cyngro. I’ll be handling most of the writing duties for the main narrative, with Dawn doing… well, everything else. TSS: You are on your second year of doing Mega Man. What have been some of the challenges so far in writing that book? IF: Initially, the biggest challenge came from having to adjust our plans. Originally we were going to go straight from “Spiritus ex Machina” to the “Blackout: Curse of Ra Moon.” But then Mega Man’s anniversary came up, and we were asked to acknowledge it, which is where “Rock of Ages” came from. And then the crossover came up, so we decided to not mangle the Ra Moon arc and tell some original stories to fill the time. TSS: Do you think you’ll ever get a chance at other Mega Man timelines? I’d love to see a “Legends” book. There are some great characters there. IF: I want to write Mega Man X so much it hurts. But it all depends on the success of the current book. If folks want to see more Mega Man-type books, you’ve REALLY got to pour some attention (by which I mean money) into the current book. TSS: What was the decision in making some of the robot masters good guys? Was it the fact that there would be more and more of them (due to the sequels) which would be too much for him to handle, or where there some personalities you liked that you wanted to keep around? IF: It stemmed from the original Light series being good to begin with, and from Mega Man’s normally non-combative nature. Mega Man wouldn’t want his “cousins” dead, and they only attacked because of Dr. Wily’s meddling with them. It only made sense they’d be repaired and given a second chance. That, and they show up in later games (to one degree or another) so they needed to return. Might as well get the most mileage out of the characters, right? TSS: Now, we have Mega Man and Sonic together in “Worlds Collide”. This would be a dream project for many fans and gamers. How excited were you to get to work on this? IF: I think the squeal I made registered only for dogs. TSS: We already have Sonic and Mega Man fighting right on panel one. What is it about their personalities that would clash? IF: Ultimately, it’s Sonic’s fault. He’s in a tense situation, he sees a robot he’s (pretty sure) has been kidnapping his friends – he’s not going to stop and ask it to politely stop. He’s going to do what he always does: smash the robot. Mega Man, by this point, has learned that when he’s threatened, he needs to put the attacker down before trying to play nice. They both get into their personal versions of “get the job done” and the sparks fly. TSS: Sonic or Mega Man….who has the better rouges gallery in your opinion? IF: Are we specifying games-only or comics too? I guess I’d fall more towards Sonic, since the majority of his enemies are more fleshed out than Mega Man’s. But give the comic enough time, and they’ll easily be on par. TSS: Eggman has used the Genesis wave and now we have a Sega centric Sonic world. What was decision for not having any characters from the comics? Was it mainly for new readers? IF: The entire arc was built with the new and casual readers in mind. With just Sonic’s game-centric friends and Mega Man’s world, the cast is already cumbersomely large. Adding in the comic-exclusive cast would just overburden the story with characters and subplots. TSS: Okay, related question and a big one that requires a little bit of tiptoeing, but many fans have this concern. Since there have been a lot of, shall we say ”backstage shenanigans” as of late, what are the chances of the Sonic comic experiencing a “52” reboot of sorts? IF: I’m not discussing our post-crossover plans right now, especially in that context. TSS: Now I got an image of you, Paul and Jon Gray doing some backstage shenanigans. Can you have Jon draw that for me? IF: You don’t “have” Jon Gray do things for you. He just sort of… does. He’s a force of nature. TSS: You’ve either created or retooled many older characters (Fiona, Scourge, Shard) and given them a new lease on life. Which one has been your favorite to create/redesign? IF: Scourge was kinda thrilling since it was my first real job on the comic. Fiona was satisfying just to give her a solid voice and direction. I’m really happy Shard has been so heartily embraced by the readers. For a favorite, I guess it’s a toss-up between Scourge and Shard. TSS: What do you feel has been your biggest accomplishment in the series so far? IF: When I see a lot of talk of when to jump into the series, folks typically recommend jumping straight to my run. I came in with the intention of tightening things up and making the book fun again, and I think I’ve done that. TSS: After “Worlds collide” , you’ll be starting on “At all costs part 2” can you give us some details? IF: It will deal with Naugus’s control of the throne and Tails Doll’s attack on the city. It’ll also be something of an introduction to the next story arc and the long-term agenda for the book. TSS: Of all the Sega Sonic games stories, which one would you like to adapt/write into the comic? IF: I’d like to give Sonic Heroes a shot, to tighten it up and better define its link to Shadow’s game. Part of me wants to give Sonic06 a shot, specifically for a few scenes I’d like to do over. TSS: I think you did a fantastic job on “The Chaotix Quest”. Is it hard to write a story with a balance of action, drama, humor and warmth? IF: I’m trying to think how to phrase this without sounding like an egomaniac but… not for me. I just set out to write a story I’d like to read. There are other factors, of course, and people who help keep me focused and to revise, but it’s not something I typically struggle with. TSS: One of my favorite characters is the good Metal Sonic, Shard. He seems to be going through a bit of a Pinocchio complex where he wants to be more alive/accepted. Can you give us any details on his future? IF: Fans wanted him to stop being smashed to bits every time he shows up. So I’ll be avoiding Metal Sonic “death” as much as possible now. TSS: Shadow has not appeared much lately in the comics despite his popularity with the fans (kids especially). IF: That’s mostly been circumstantial. We’ve just had to prioritize other stories. He’s in the crossover, and I’m hoping we’ll do something Shadow-centric shortly after the crossover. TSS: In “lockdown”, we saw an alternate reality jail that had both Mephelis and the Werehog. Any chance we’ll be seeing either of these two in the comics? IF: Quite possibly. They’re both pretty popular. TSS: If you got to redo Sonic’s world to your personal liking, what would that be like? IF: It’d be much closer to the games, with locations and events as close to the game canon as possible. At the same time, the comic has endured by introducing heroes and villains from around the world, so I wouldn’t be messing with that formula. So you’d have Sonic and the Freedom Fighters battling the Eggman Empire in the various game zones, helped and hindered by original mobians. Also: the Master Emerald wouldn’t have been made out of a mammoth, there’d be no human/overlander confusion, and Knuckles’s backstory wouldn’t be he was a Hot Pocket of Destiny. TSS: While I know there’s been some ideas you’ve had that Paul’s had to say no to, has Paul had any ideas that you’ve said no to? IF: Only one comes to mind, and it was an off-the-cuff thing he tossed out there for consideration. It involved turning Ash Mongoose into a new villain, turned monster-like by a corrupted pool of the Source of All. TSS: Which story was the hardest to write? The most fun? TSS: A long while back in the “Sonic Adventure” adaption, Amy used magic to make herself older to be more appealing to Sonic (which in turn is how she changed her looks). But since she’s likely more closer to Sonic’s age than Tails, why is she still treated as a kid? IF: She hasn’t been during my run. If she’s treated differently, it’s because she’s got a volatile nature. You don’t expect Tails to ever flip out over something and smash you with a hammer, do you? TSS: Out of all the Sega Sonic characters, who is in your top five? Bottom five? Bottom Five: Marine, Dark Gaia, Metal Overlord, and the Babylon Rogues. Okay, that’s six, sue me. TSS: Some Sega Sonic characters take a while to grow on the fans (Big and Cream for example I still don’t care for chip). Which character did you not care for, but grew on you over time? IF: I was certain I’d hate Chip, but he was played perfectly – little comedic moments, but mostly out of the way, and pulled his weight during the final boss fight. I hated Cream out of principle at first, but once I figured out where she fit into things, grew to love her. I hated Big at first since he seemed so out of theme. Now I’ve seen the light and become a Big-liever. We hope you enjoyed Jason’s talk with Ian! You can check out what the fans had to ask and what Ian had to say to them over on Sonic Talk. Funny that he mentions Professor Pickle and Wentos. Two of my favorite Sonic characters are Professor Von Schlemmer and Wes Weasely who are extremely similar to Pickle and Wentos in concept. Haven’t we seen this already with FTA & Smoovies interview? Nice interview, also I’m surprised that Blaze is one of his top 5 characters since she doesn’t appear that much in the comic, hope we get to see a new arc featuring her, perhaps a story where she’s the villian but without being robotized nor mind-controlled, just with a different agenda.